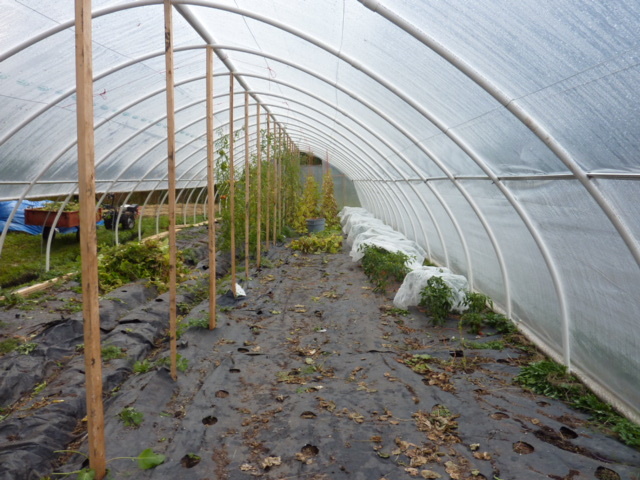 The plants in the big tunnel are done. Well, mostly. I placed a layer of reemay on top of the 3-row bed of Carmen peppers that still look good but could use some ripening. Otherwise, I have removed all viable tomatoes and cucumbers and have composted the remainder. 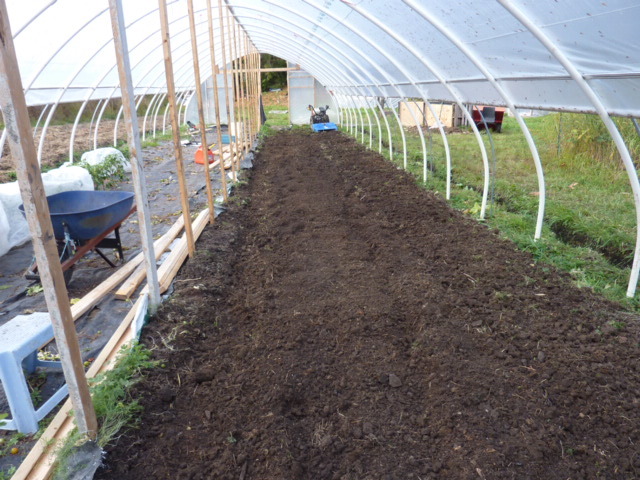 The double pallet-composter that Dad built near the tunnel will be nicely filled after the peppers are out. I removed the lumber wrap from the east half of the tunnel and spread it outside in a double layer behind the tunnel to hopefully keep the swamp grass it’s covering from becoming a menace next year. Underneath the wrap were some very hard hills and furrows, made hastily in the spring with the help of the BCS rotary plow. Near the side where the open-pollinated pepper resided in a flat bed, an 18” wide strip of the soil there is as hard as concrete, since we tended to use that area as our sidewalk over the summer. Rototilling the hills was challenging but nothing compared to this compacted strip. 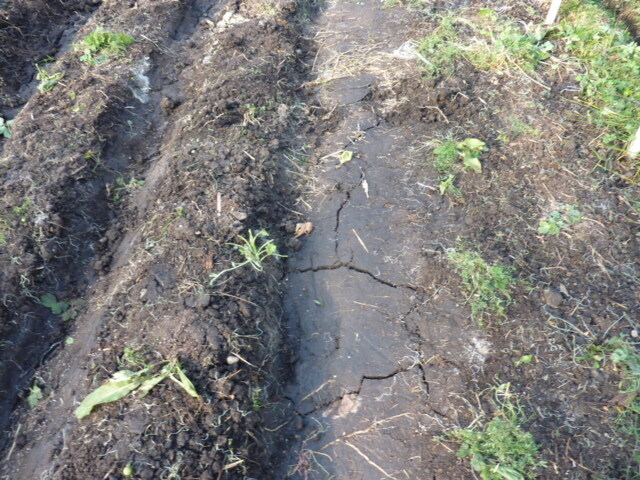 Since the blades of the tiller turn faster than the wheels of the tractor, the whole unit leaps forward when the blades cannot break the surface of the soil. I had a couple of close calls in nearly crashing into the bottom of the PVC posts anchored at the very edge of the bed. Happily, 3 or 4 passes later and the soil is looking pretty decent. I’ll add some sand and compost and maybe some other stuff to lighten it prior to planting in it next spring. Because of our poor sun exposure, I don’t think a cover crop of fall rye (which would be nice for breaking the clay up a bit) would be able to do much prior to early May. I may change my mind, though. 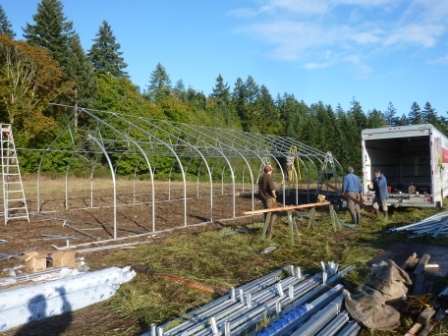 While I wait for more peppers to ripen and now that the inside of the tunnel is relatively open and flat, I will do a couple of structural modifications in preparation for the tunnel’s first winter. In the spring, I simply screwed the polylock track (the aluminum channel which uses z-shaped spring wire to pinch polyethylene inside it) to the arches. In other words, only the sched 40 wall thickness of the PVC plastic and a few #8 wood screws are holding the full force of a winter’s wind being harnessed by the poly. I’ll modify that by bolting the track to the PVC. I will also add a couple of diagonal V-braces to each side of every centre post to distribute vertical support a few feet on either side of centre. Hopefully this will allow any snow build up at the flattest part of the tunnel to sit there without collapsing the structure. Any snow further away from the centre should fall away before getting too heavy since the slope there is greater. Meanwhile, the official Tuesday market is over. But the unofficial one starts this week. A few of us plan to be there. I’ve got a boatload of brassicas and some other stuff that people have just started to think about. Cabbage soup anyone? 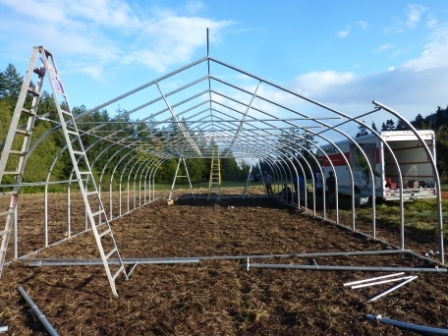 This week I spent 3 half-days at (farmer) friend Colin’s place in the Fulford Valley, helping with the installation of his first (of two) 25’ X 60’ Sliptube mobile greenhouse. Sliptube is based in Surrey, BC and builds all types of fabric-covered volumes including aircraft hangars. I showed up 3 or 4 hours into the first day. 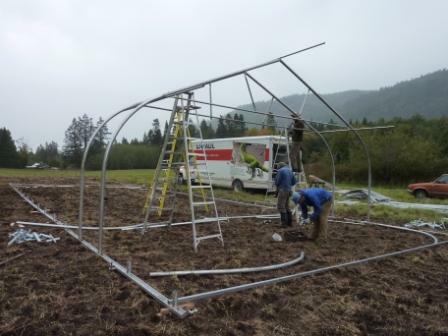 With 4 guys on the job, the steel skid foundation was set in place and a couple of ~2.5” steel arched-trusses were connected at one end. The design seems straightforward: heavy gauge steel, appropriate bracing, rugged connections. The odd glitch was quickly resolved by company rep Bob. By lunch time on the third day, the house was essentially complete. Colin’s first assigned task for it will be for the chickens to start munching on the wireworms that lurk below the surface of the recently disked soil. 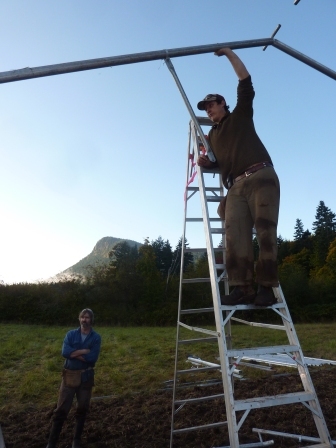 Next week the crew minus Bob and me will construct (farmer) friend Zak’s identical unit. Then back to Colin’s for his second one. These guys both have a ton of experience in agriculture so it’s both encouraging that, like me, they’re investing in greenhouse space… and discouraging, since they plan to grow the same crop varieties in theirs as I do in mine even though island demand for these crops won’t necessarily increase, at least not at current prices. Sigh. Would I invest in such a greenhouse product? Well, I would like to, I suppose, but I just can’t quite commit to the outlay until I’m convinced I can sell everything I plan to grow. The cost per square foot of this unit approaches $5 and ~5 minutes of construction labour. 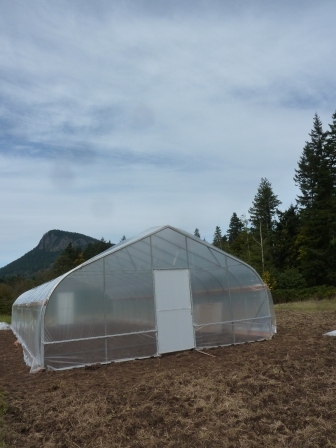 The large PVC/poly tunnel I built also came in at about 5 minutes/sf of construction labour but only about $1.25/sf of materials. On the other hand, I’m still not sure whether the tunnels I built will withstand our snow load even though this design has done so in Saanich for a few years. Also, I can’t drag my tunnels to new ground like they can theirs. Finally, theirs have more volume due to the higher ceiling that using steel permits. Guess we’ll see what happens over time.